1986. 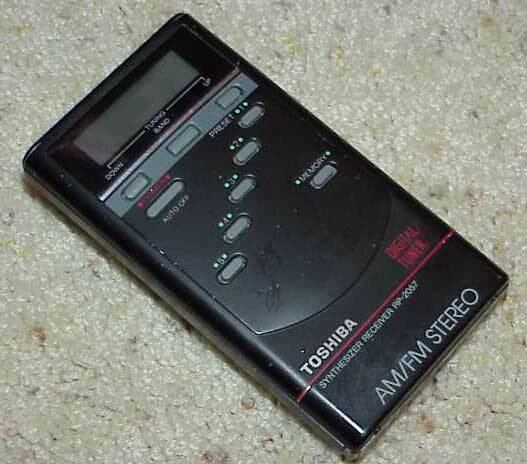 Behold, the top of the line portable from Toshiba in ’86. Can you believe the features of this thing? Digital tuning, logic controls, Dolby, presets, auto-reverse, and a graphic eq. Unbelievable. No doubt there was some sticker shock for this back in ’86–we’re sure this model sold for at least $150 new back then. We’re willing to bet (and justify) one of these getting top dollar on Ebay today. 1981. Every collection has a “signature piece” and this may be it–Toshiba’s KT-S2. With the weight of a brick this model shows absolutely every sign of quality–from the metal chassis, to the ejecting well door, to the commanding tape control buttons. The KT-S2 offered separate left and right volume controls, normal/metal tape type swith, hi-lo tone switch, and radio/tape function switch. The requisite 4 penlight battery power only adds to the massiveness of the KT-S2. Take a closer look at the front. You’ll notice a yellow plastic button set within the chrome play button. That’s the “Hot Line” button, which mutes the portable’s audio, captures ambient noise via an internal microphone and sends it to the user’s headphones. The mystery is what the “T.L.” abbreviation stands for above the play button. The most unusual feature of the KT-S2 is the FM receiver. 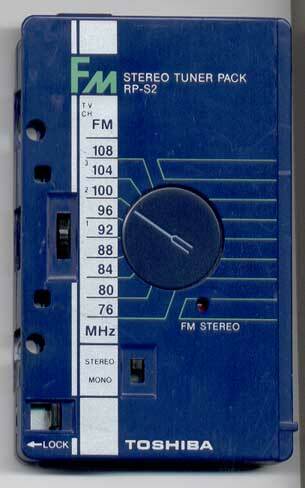 Yes, the KT-S2 offered an FM receiver and cassette playing capability way back in ’81. 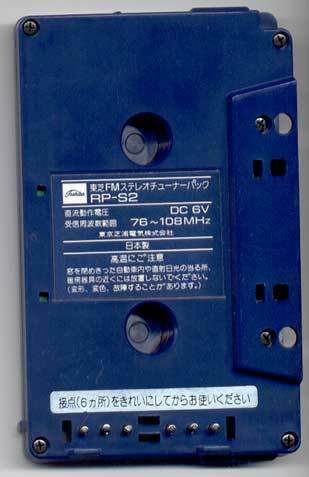 The radio portion is contained within a cassette-shaped component which fits into the cassette chamber. This device has its own model number, called the RP-S2. Even this little module has some cool features- an LED indicator for stereo and a mono-stereo switch. Here’s a pic of the front of the RP-S2, and here’s one of the back. Rumor has it that an AM module was also available in Japan. 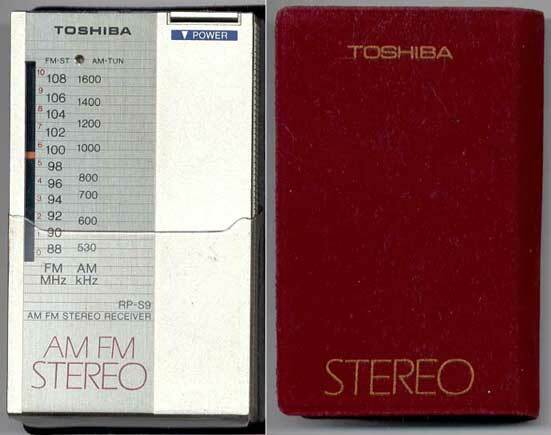 As far as we can tell, Toshiba was the first, but not the last to offer radio tuning within a removeable module like this one. 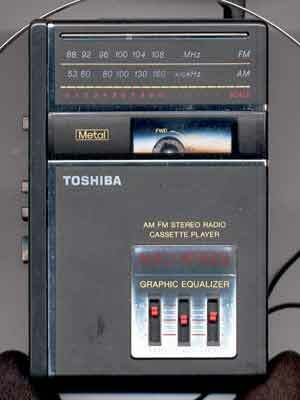 *Update* Yep, the RP-A2 was Toshiba’s AM Tuner Pack that worked in both the KT-S2 and KT-S1. 1986. Boy, what a piece of crap. Sure, it looks innovative–the rewind and fast forward controls are unusually placed on the well door. Even more unusual is how these buttons operate–as you push them, they simply direct the flywheels down, which activate their movement. Sounds interesting, but I tried this out on one that I just purchased and when I opened the door, the mechanism literally flew out of the case into several pieces. I tried piecing it back together, but no luck. The cheap springs and plastic parts simply would not function as they were intended. No wonder why Toshiba dropped out of the portable market. It’s hard to believe this model was in the same line as the ultra-cool 4066. 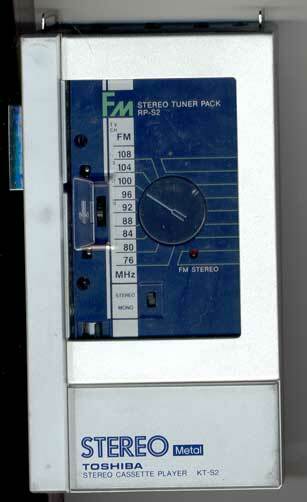 This model offered a battery LED indicator, a locking well door, and a normal/CrO2 & FM/FM stereo switch. Take a look below at Panasonic’s for a better implementation. 1986. 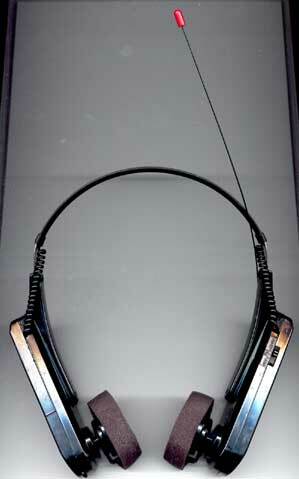 Nice little headset unit offered by Toshiba during their walkman heyday. This one is powered by two AAA batteries, has a little whip antenna and features digital controls! The digital tuner is display in an analog fashion via an LCD bar indicator. Nice sound, too. Controls are smartly shaped so you can access them while wearing the headset. Audible beeps tell you when you’re tuning up the dial, or down or accessing one of the 5 presets. Here’s a pic of the entire unit. 1981. 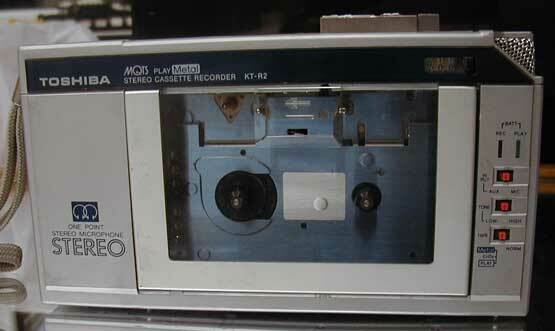 Sold around the same time as the KT-S2, the KT-S1 had a similar chassis, but featured a single volume slide control, and dual headphone jacks. 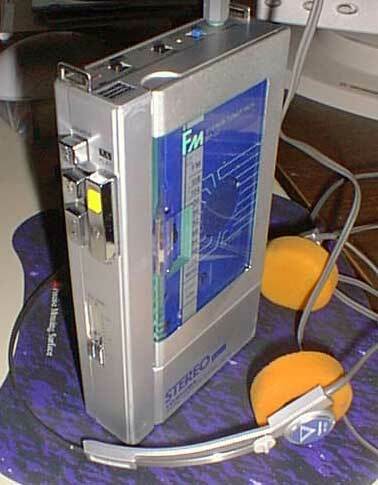 This one also featured the FM radio cassette module. I was lucky enough to find one with the super rare RP-A2 AM cassette module!! 1986. 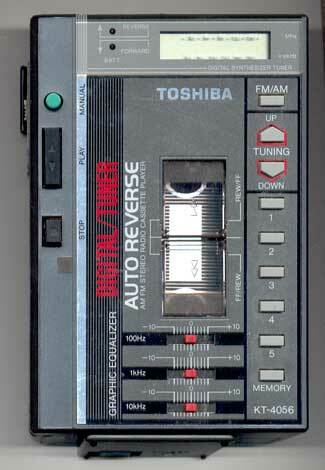 Second to the KT-4066, the KT-4056 was almost the same, but lacked the Dolby NR feature. Very complicated looking stereo! 1986. Attractive little radio with the height and width of a credit card. This little AM/FM receiver has exceptional tuning! It has an unusual push lever power switch and is powered by two AAA batteries. It sold for around $40 back in its day. The little red velvet carrying case is a sweet compliment. 1988. 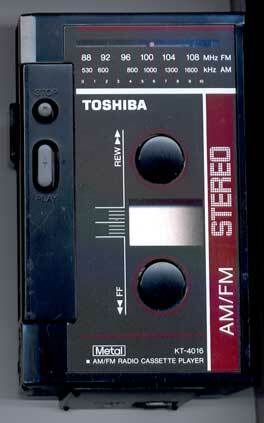 As you can see, as we reach the latter half of the 80s, we depart from innovative and unusual walkman designs. This Toshiba lacks any unusual quality–it has a 3-band equalizer, AM/FM tuning, auto-reverse, typical functions and options for the period. Blah. 1981. Wow, this is a cool one. 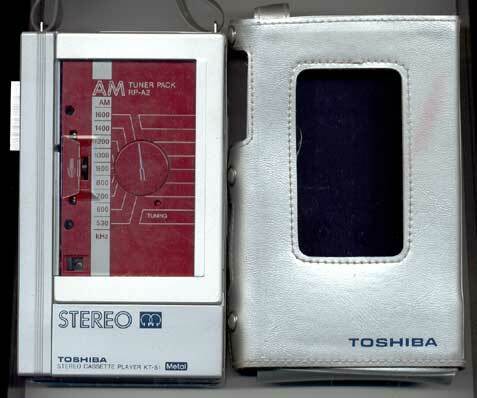 It’s Toshiba’s first recording portable stereo and even has a built-in stereo mic! Our fellow vintage electronics collector, Vassilios in Greece provided the pictures of this sleek model. Here’s a side-view pic. Finding such an old portable in this shape is indeed lucky! Thanks, Vassilios! 1987. 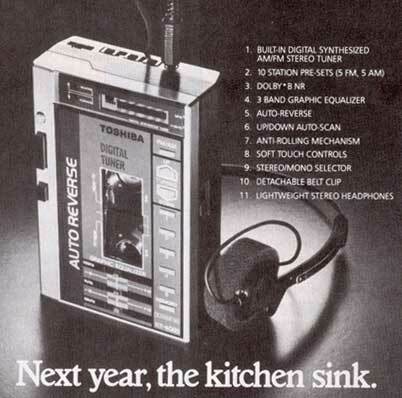 One of the few portable stereos with digital tuning from the ’80s. Toshiba was one of the few companies who marketed this feature, and they did pretty well with it. I just found my RP-2057,Havent seen it in years.It still had batteries in it, I removed the old batteries and cleaned the contacts and the little radio still works sounds great.1-30-2017.